Charlene Marie Makarits, 44, Injured In Crash On Lake Worth Road East Of Wellington | Schuler, Halvorson, Weisser, Zoeller & Overbeck P.A. 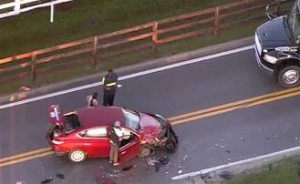 One person is dead and another seriously injured after a crash east of Wellington, Palm Beach County Sheriff’s Office authorities said. A 47-year-old driver lost control of the 2000 Ford Explorer he was driving west on Lake Worth Road near Lyons Road east of Wellington, authorities said. The Explorer crossed the median and overturned. The driver was ejected from the vehicle and was pronounced dead at the scene by rescue crew. His passenger, Charlene Marie Makarits, 44, of Greenacres, was seriously injured and transported to a hospital. Neither the driver nor his passenger, Charlene Marie Makarits, was wearing a seat belt prior to the accident, records state. The cause of the crash is unknown. Palm Beach Sheriff’s Office is investigating the cause of the crash.